PURE Bioscience, Inc. (OTCQB: PURE), creator of the patented silver dihydrogen citrate (SDC) antimicrobial, announced today that the Company raised $1.27 million from the recent exercise by all of the holders of the 2,820,670 warrants expiring May 23, 2016. Use of proceeds will include the commercialization of FDA approved PURE Control® antimicrobial as a processing aid for fresh produce and for raw poultry. PURE Control is a superior, broad spectrum, non-toxic intervention to prevent foodborne illness and dramatically reduceSalmonella, Listeria and E. coli during processing. PURE Bioscience, Inc. is focused on developing and commercializing our proprietary antimicrobial products primarily in the food safety arena — providing solutions to the health and environmental challenges of pathogen and hygienic control. Our technology platform is based on patented stabilized ionic silver, and our initial products contain silver dihydrogen citrate, or SDC. SDC is a broad-spectrum, non-toxic antimicrobial agent, which offers 24-hour residual protection and formulates well with other compounds. As a platform technology, SDC is distinguished from existing products in the marketplace because of its superior efficacy, reduced toxicity and the inability of bacteria to form a resistance to it. PURE is headquartered in El Cajon, California (San Diego metropolitan area). 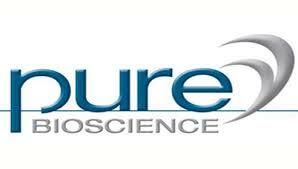 Additional information on PURE is available atwww.purebio.com. Any statements contained in this press release that do not describe historical facts may constitute forward-looking statements as that term is defined in the Private Securities Litigation Reform Act of 1995. Forward-looking statements inherently involve risks and uncertainties that could cause our actual results to differ materially from the forward-looking statements. Factors that could cause or contribute to such differences include, but are not limited to, the Company’s failure to implement or otherwise achieve the benefits of its proposed business initiatives and plans; acceptance of the Company’s current and future products and services in the marketplace, including the Company’s ability to convert successful evaluations into customer orders; the ability of the Company to develop effective new products and receive required regulatory approvals for such products, including the required data and regulatory approvals required to use its SDC-based technology as a direct food contact processing aid in raw poultry and raw meat processing; competitive factors; dependence upon third-party vendors, including to manufacture its products; and other risks detailed in the Company’s periodic report filings with the Securities and Exchange Commission (the SEC), including its Form 10-K for the fiscal year ended July 31, 2015, its Form 10-Q for the first quarter ended October 31, 2015 and its Form 10-Q for the second quarter ended January 31, 2016. You should not place undue reliance on these forward-looking statements, which speak only as of the date of this press release. By making these forward-looking statements, the Company undertakes no obligation to update these statements for revisions or changes after the date of this release.